Collecting measurements from a mature male Narrow sawfish. The sawfish is being restrained by placing downward and sideways pressure on the two dorsal fins. 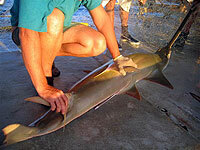 A common technique used by fishers when handling sawfish and shovelnosed rays. Note the long claspers a characteristic depicting the animal as being male and mature. For the last few years, freshwater biologist Dr Dean Thorburn has been surveying the rivers of Northern Australia to assess our sawfish populations. Includes transcript and video.